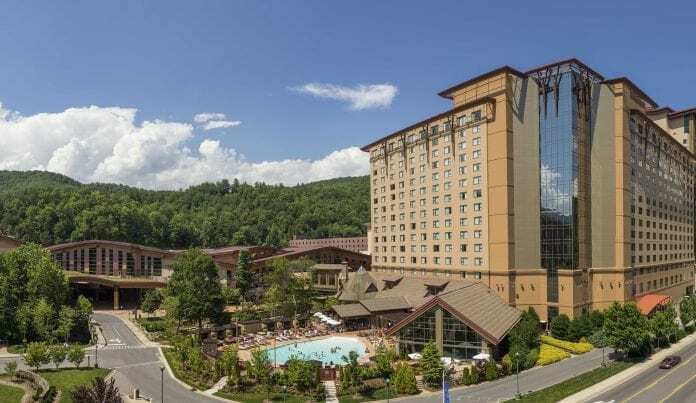 Harrah’s Cherokee Casino Resort is an enterprise of the Eastern Band of Cherokee Nation, and is managed by Caesars Entertainment, Inc.
Tucked away within the scenic Smokies is the luxurious Harrah’s Cherokee Casino Resort. The 56-acre property sits at the entrance to the Great Smoky Mountains National Park, 50 miles west of Asheville. The drive leading to the resort is as scenic as the resort views, with layers of mountains serving as the backdrop of the horizon. The resort layout is vast and there is plenty to enjoy. For gamers, there is no shortage of all day entertainment. Choose from 172 traditional table games including blackjack, roulette, craps, mini-baccarat, poker, more than 3,500 slot machines and a high limit games area. The 150,000 square foot gaming floor also offers a tobacco-free gaming area. After a big win, enjoy some shopping within Harrah’s Cherokee at Swarovski, where jewelry, watches and other fine crystal ornaments can be purchased. Additional shops offer ladies apparel and jewelry such as at Studio and Kanati’s. Men can find attire at Top Drawer, which offers Tommy Bahama and Yeti products. There are ample dining choices from casual to high end. The impressive selection includes a Ruth’s Chris Steak House and BRIO Tuscan Grille. Check out the breakfast buffet at Selu Garden Café. For a quick bite, enjoy one of the food court selections such as Uno’s Express Pizzeria, Earl of Sandwich and more. Carve out half of a day, or a couple of hours, for the Mandara Spa. The expansive sanctuary has indoor and outdoor relaxation options. Heated stone lounge chairs are located by the whirlpool and sauna and are perfect after a massage. Outside is a balcony facing a creek, which separates the spa from the casino area. It is the antithesis of the gaming scene, where casino bells are replaced with the sounds of the bubbling brook. For some soothing relief of tired and aching muscles, check out the Balinese Massage. An expert masseuse combines Native American and Balinese-inspired treatments. In the Balinese tradition, massage and the power of touch are featured, but Mandara Spas also emphasize beauty, rejuvenation and indulgence, leaving guests with a remarkable radiance. The Mandara signature facial is customized to each individual. Recreational activity includes golfing and fishing. The Sequoyah Golf Club – an 18-hole, par 72-championship course, is located 3 miles from the casino. Fishing can be enjoyed along the hotel river. The resort also showcases one of the largest permanent exhibitions of contemporary Eastern Band of Cherokee art. Unique rtifacts can displayed throughout the property. Harrah’s Cherokee features top performers in its Event Center. It includes two VIP suites with 65 seats and two smaller VIP suites with six seats. The event space accommodates ove 3,000 seated guests. There is also an ornate ballroom and the Essence Lounge. Just under a five hour drive from Nashville, Harrah’s Cherokee Casino Resort is the perfect getaway, offering a harmonious balance of play, rest and relaxation. It is the ideal spot for releasing stress, whether at the casino, the spa, the scenic outdoors or a combination of all. Add the dining and shopping and it truly completes the experience. Consider the one stop destination for a glorious weekend getaway.